When I was growing up in Montreal during the 70’s and 80’s, grocery retailers like Steinberg’s used to not only pack your grocery items into bags, they also loaded them into your car by way of drive-thru pick up. Before Tim Horton’s had drive-thru’s – grocers had it perfected. This certainly wasn’t the e-commerce solutions that retailers enable today but in a simple manner an order was picked, a ticket was attached to each bag in the order and they were placed into a plastic bin that was staged in a holding area at the pick up location. Fast forward to 2018 and the age of robotic carousels, autonomous cars (level 3 and 4) and e-commerce platforms that make my childhood experience at Steinberg’s pick up drive-thru seems like a Flinstones episode. In today’s race to win consumers, retailers are investing at great lengths in talent, systems and business models that will win customers on price and service. The steaks are high and speed to market with the winning e-commerce business model is a burning imperative for the Titans; Amazon and Walmart. 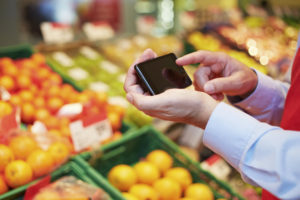 The Canadian grocery market sector is estimated at $120 billion and currently grocery e-commerce is only .8% of that which is estimated to rise to 2.5% in four to five years according to Sobey’s research. Are retailers becoming technology companies or are they technology companies that have retail operations? Either way, technology in retail is enabling new business models and customer experiences. For example, Amazon Go opened on December 5, 2016 in an 1,800 square foot format store in Seattle where there are no line ups and no check-out counters – simply grab and go as scanners know what you bought and your Amazon would be immediately debited after leaving the store. It might feel awkward stuffing a bag of groceries and walking out the without paying at a check out counter or self serve kiosk but Amazon discovered that they could mesh multiple technologies (with sophisticated algorithms) to provide a welcomed shopping experience – no more line ups. Bill Bishop calls this mindset “New Factory Thinking”. If your organization is not challenging existing business models, technologies and ways of thinking and moving the business forward through innovative solutions that customers will pay for then there will be a quick path to the business grave yard. A new contender for Titan status is Sobey’s who has signed a $70 million deal with British technology company OCADO. This will allow Sobey’s customers to shop on-line or via an app and their order will be filled at a state-of-the-art fulfilment center in Toronto and shipping the products to the customers door. Initially it will be for the local Toronto market but quick expansion will occur thereafter. This new distribution model is anticipated to be launched in 2020. Logistics providers (including transportation enterprises) need to be collaborative with their customers on meaningful conversations and projects about stream lining the supply chain. Flexible and robust distribution hubs, innovative transportation solutions that provides different service levels to mitigate costs and meeting ever tightening delivery schedules all have to be contemplated and designed as the last mile is getting ever more complex. Many companies in the logistics industry don’t have the same resources as the retail Titans. New ventures and partnership models between asset, non-asset and technology companies need to be contemplated. Will blockchain infrastructure enable these collaborations? Certainly we have moved far from the days of Steinberg’s drive up model. However, the value creation for retailers to satisfy their customers desire for convenience in the multi billion dollar grocery and retail sector and gain more share of wallet sales will be the driving force for the Titans. New business models and technology providers will enter the arena and more pressure will be put on last mile delivery networks and distribution innovation. Through collaborative initiatives, challenging the status quo and harnessing technology (TMS, ERP, WMS MRP and Blockchains) the “New Factory Thinker” will be rewarded for their innovations.